Departement of the Vaucluse - Pop. : 88.312 h.
On highway A8 and route N7, 600km from Paris, 100km from Marseille. 2:30 from Paris by TGV (High Speed train). 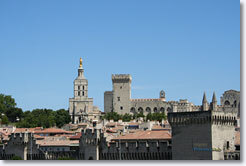 City of history and city of theater, the fortified city of Avignon will not leave you in different. 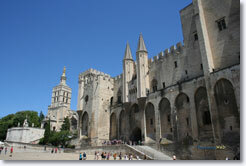 Avignon's architecture is marked by papal history. Going through any of the seven doors of the superbly preserved walls one discovers the city of the Popes. 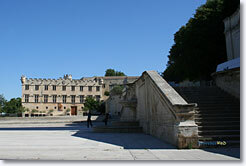 The Palace of the Popes built in the 14th century overlooks a lively square. 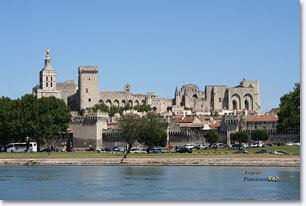 Nearby are the museums the Petit Palais and Palais du Roure, not too far away stands the famous Pont d'Avignon. Take your time wandering about the streets of Avignon. The ancient streets, the courtyards of the private mansions, the renovated facades will all charm you! One of the most elegant streets is the rue Joseph Vernet, adjacent to the Calvet museum and the Requien Museum. Don't miss the Antiquaire quarter, the Place de l'Horloge or the Chemin de Ronde which will take you to the Rocher des Doms. From the top of the ramparts you can understand why the site was chosen for a fort: Avignon stands high above the immense plains of the Rhône River and is the strategic point of the whole valley. 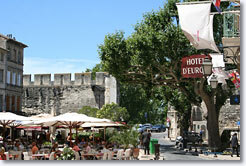 The theater festival has made Avignon important in modern times. Started in 1947 by Jean Vilar, every year between the 10th of July and the 5th of August nearly 120,000 spectators come to discover new talent or admire those actors already known. These shows (dance, theater or music) are enhanced by the background of powerful history and often appear renewed or refreshed in this environment. The Off Festival is a series ot street shows set up by would be actors and is considered to be an excellent work lab for these aspiring young people. Late at night when the shows are over the terraces fill up with actors and spectators alike all creating a unique atmosphere found only in Avignon in the summer. 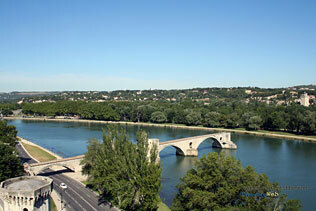 The Pont d'Avignon( Pont de St. Benezet). The Opera. The Hotel de Ville. Various churches. Cloître St. Louis. 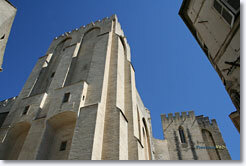 The Musée en Images (more than 1000 images of Avignon). Musée du Petit Palais (painting and sculpture from the Middle Ages to the Renaissance). 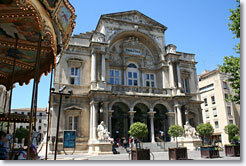 Musée Lapidaire (archeology, prehistoric times, paintings from the 16th to the 20th cent.). 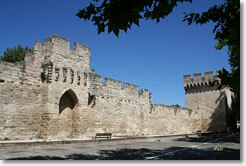 Morières les Avignon (10km), Le Pontet (3km).